A bonus post today, simply because I wanted to share these photos. Top: It's been so hot here this week that in the buildings without modern air-conditioning, every door and window is thrown open for any hint of a breeze. 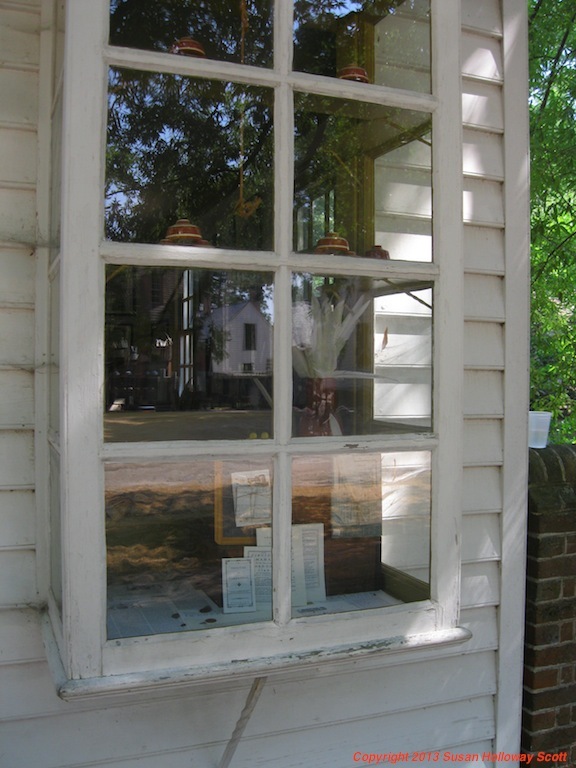 This is looking into (and through) one of the outbuildings behind the Peyton Randolph House. Hard to imagine being one of the 18th c. women using those flatirons (standing on the table) in 100 degree heat! Left: This is one of the upstairs bedchambers in the Wetherburn Tavern. The gentleman who has removed his wig (the heat again?) has paid extra for one of the "private" rooms - though he'll likely still be sharing his lodgings with several other men if the House of Burgesses is in session and the town is crowded. 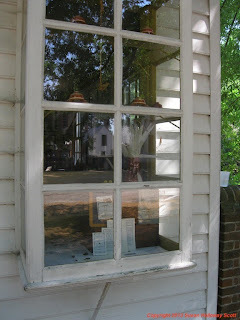 I need to visit Williamsburg, I think - definitely a future holiday destination! Wonderful photos -- I wish I were there, though do I really, in this heat? I'm glad I'm not a re-enactor right now.